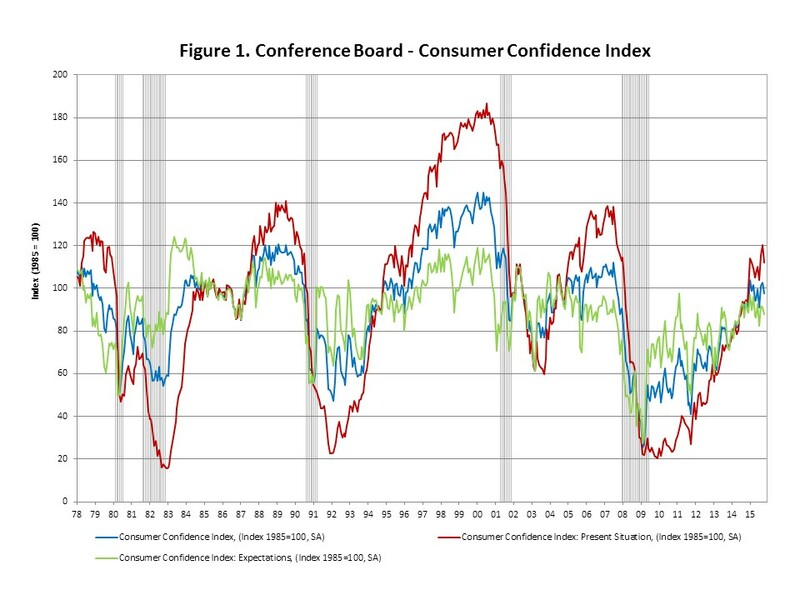 The Conference Board recently released the Consumer Confidence Index and its two subcomponents, the Present Situation Index and the Expectations Index, for October. The Consumer Confidence Index dropped to a level of 97.6 in October following the September’s optimistic assessment of 102.6. The present situation index declined to 112.1 from 120.3 in September, and the expectations index also decreased from 90.8 to 88.0. In October, consumers were less optimistic about both the present situation and the short-term outlook. Particularly, consumers reported that the present jobs were not so plentiful and the present business conditions were “bad”. However, despite this monthly decline confidence has been trending up and remains relatively high by historical standards. The Conference Board also asks respondents about their expectations regarding the interest rates. In the October survey, 62.7% of respondents reported they expect interest rates to be higher in the upcoming twelve months, down from 64.4% in September and more people expected interest rates to remain at the same level in the upcoming twelve months, perhaps anticipating the lack of action taken at the Federal Reserve regarding increasing interest rates (FOMC). In the September blog, we showed that the impact of expectations of changing interest rates on plans to buy a home is relatively weak. Instead, overall consumer confidence has a much stronger impact on plans to buy a home. Despite the monthly decline in overall confidence and consistent with the steady upward trend since the end of the recession, the Conference Board reported an increase in the share of respondents planning to buy a home within six months, from 5.8% in September to 6.3% in October. Also, 1.4% of respondents reported they have plans to buy a new home within six months, higher than 1.3% in September.